Tomorrow, the Gates Foundation will match donations for Giving Tuesday. Any donation between 6:00am to 6:00pm on Tuesday, November 28, 2017 will be matched by the Gates Foundation! 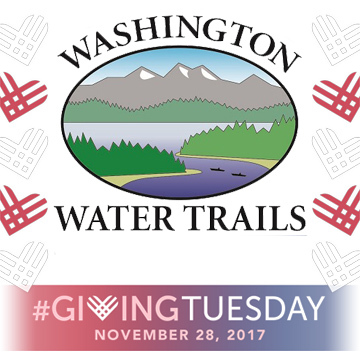 Make a donation to Washington Water Trails Association by entering a donation amount, clicking on the “Make a donation!” button below, and then filling out the secure donation form. Your donation helps protect public access to waterways and valuable natural resources for generations to come. Today’s gift can help safeguard public access to waterways for tomorrow. WWTA advocates for access to the water, and works to keep our existing contracts with public agencies along the Cascadia Marine Trail, Lakes to Locks Trail and others. The Marine Trail is a true legacy to build on. Getting people on the water and providing access. Creating non motorized campsites and the guidebook. Long-term stewardship on Blake Island. The Guide Book is an essential part of my trip planning. I support WWTA for their advocacy in State legislature and their organization of work parties. Securing manpowered beach-able watercraft only campsites. The Cascade Marine Trail sites. The guidebook — print and online versions. Working with state agencies to raise awareness and create opportunities for paddlesports. The amazing campsites that have been made and kept available to paddlers. I loved the gear swap!! Protecting the Lummi DNR site to help with maintenance. Shoreline access and launching sites. Promoting non motorized vessel exploration of Washington waterways. getting ‘the word’ out to everyone interested, re state-wide and local access points and signage. The CMT Guide Book is amazing. Anderson Island is one of my favorite camp sites I’ve been to in the past few years.